Nowadays, we often hear the word “mindful” almost everywhere. Just yesterday it came up for me at the end of a Parent/Toddler class I attend with my son. We briefly discussed the need to find ways to quiet our busy minds as parents and become more aware and appreciative of our present moment. As the topic of happiness and how one finds it has become popular in recent years, so has the topic of mindfulness. There’s a growing body of evidence that suggests the benefits of mindfulness are clear and it can be considered a path that leads to health and happiness. But what does mindfulness actually mean? Being mindful simply means having good control over your attention and staying present, moment by moment. In an age where technology has made it very easy to multitask, our attention is often fractured into smaller and smaller parts. The cost is that it now has become increasingly more difficult to fully inhabit the place where we actually would like to be. Mindfulness is about the ability to place your attention wherever you want and have it stay there, until you decide to shift it to something else. Your mind is steadied when your attention is steady and not hijacked by whatever other thoughts jump into awareness. As a mother of a toddler, a wife, a consultant, and a blogger, life can sometimes be quite hectic. Like many, I’m hyperconnected. I have an iPhone, a laptop, and a mini iPad, and rarely do I let an hour go by without looking at one of them, only to be sucked in to checking the time, responding to emails or comments on the blog, or surfing the web. As my goal this year is to thrive, one key element is for me to be fully present with those—particularly my loved ones—around me, I’ve been trying to quiet the internal urge to keep in constant touch with the outside world. It’s not always easy but the return is worth the investment of effort. I find it fascinating and hopeful that science is learning about the brain’s ability to adapt and rewire itself. This phenomenon is known as experience-dependent neuroplasticity and suggests there are benefits to exercising the brain. Developing greater control over your attention is perhaps the single most powerful way to reshape your brain and thus your mind. Research says you can train and strengthen your attention just like any other mental ability. This is great news because like any muscle, attention can be strengthened with exercise. There’s hope for all of us. I am slowly learning how to quiet my mind by exercising mindfulness. Yesterday afternoon, for example, my son woke up very early from a nap. He was screaming and crying. Bad dream? Gas? Cold feet? I don’t know. I had a presentation to complete, a report to write, and dinner to prepare so I had hoped to finish one of them before he woke up. I quickly tried to soothe and gently rock him back to sleep, but it didn’t work. He was up for the afternoon and my little guy was not in a good mood. I knew he’d be too tired and cranky to play on his own so I decided to be completely present with him that moment. I abandoned all hope for the completion of the other activities I had planned. I put away my electronic devices and decided to put dinner preparations on hold. Instead, I wanted to be fully present in mind and body for my son. He needed my care and attention to help get him through what could’ve been a miserable afternoon for him. So baby and I cuddled on the sofa, sang songs, and read books the rest of the afternoon. When I felt his little warm body nestled against mine and listened as he expressed his needs and delights in toddler fashion, I knew my investment of time and mind was worth every minute. Do you struggle with mindfulness with others or while alone? How do you find ways to quiet the mind and be present in the moment? I’d love to know. Please share your experiences and tips in the comment section below. Reduce multitasking. Researchers have found that multitasking leads to lower overall productivity. Notice your breath while doing daily activities. Focus on the sensation of air moving in and out of your lungs. Use routine events–such as going to the bathroom, drinking water, getting the mail–as reminders to return to a sense of centeredness. At meals, take a moment to reflect on where your food came. For example, where it may have grown, how it was shipped, the hands that prepared it before arriving on your plate. In just a few seconds you can take this exercise quite far. Try to spend less time talking. Limit screen time. This includes screen time in various forms—watching TV, browsing the web, playing video games, checking your phone, blogging, etc. Wear a watch. You’ll avoid using your phone, an easy distraction, to check the time. Do not bring phones to bed. Fully wake before looking at your devices. Spend time in nature. Grow a garden. Take a hike. Observe and enjoy your surroundings and resist the urge to upload your moment on Facebook, Instagram or other social networks. Create a space for quiet meditation. If you have other tips on finding peace in our digitally connected world, please share them with the Petit World Citizen community! Wash the kale and spinach thoroughly. Coarsely chop the greens. 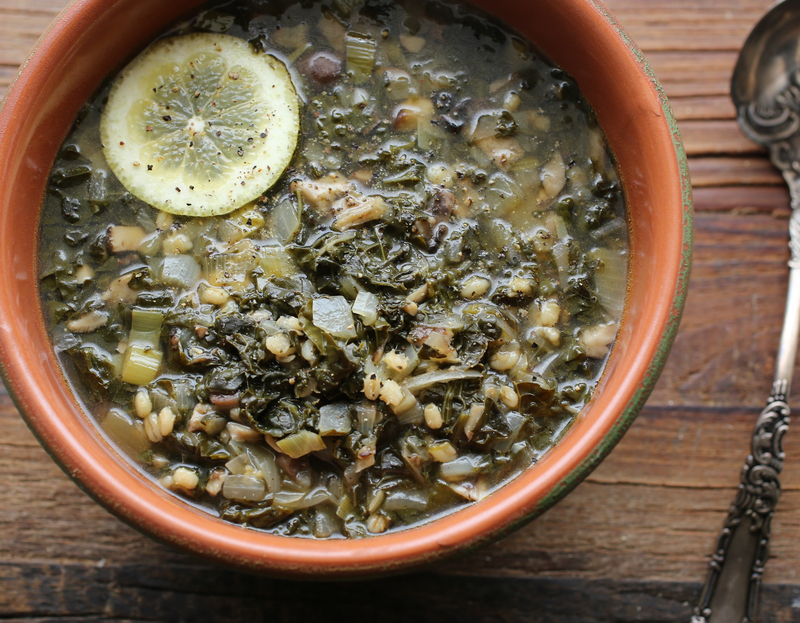 Combine the kale, spinach and barley in a large soup pot with 4 cups of water and a teaspoon of sea salt. Bring to a boil, then simmer, covered, for at least 20 minutes. Meanwhile, heat 2 tablespoons oil in a nonstick pan and add the chopped onions with a big pinch of salt. Cook them over low heat, stirring occasionally, until they soften, about 10 minutes. Add the leek and continue to cook until the onions and leek are golden brown, about 30 minutes. Clean and dice or chop the mushrooms. Heat the remaining 1 tablespoon olive oil in another pan, add garlic and stir until it starts to turn golden, about two minutes on high heat. Turn the heat down slightly, add the mushrooms with a dash of salt and the thyme and sauté, stirring often, until the mushrooms are sizzling and browning, at least 15 minutes. Add mushrooms and caramelized onions and leek to the soup. Deglaze the pans by swirling a little of the broth in them and adding it back to the pot. Add the vegetable broth and—a little less or more as needed—and purée the soup in a blender, in batches, or with an immersion blender, or leave it as is. Return the soup to the pot, add a spoonful of lemon juice, and correct the seasoning with more salt if needed, freshly ground black pepper, and a pinch of cayenne. 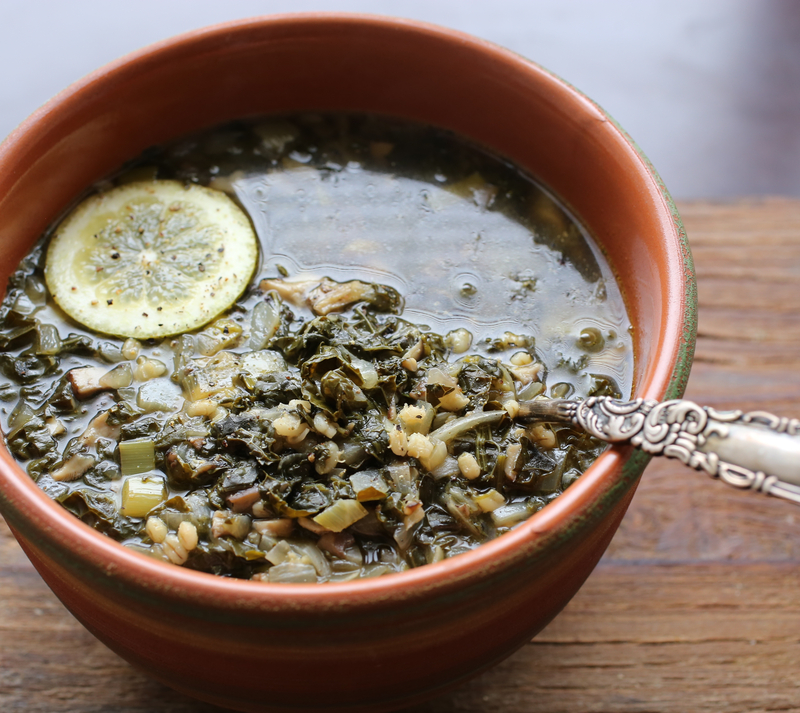 This is the moment when you must taste and adjust the soup to your own palate—and when adding that last bit of salt, remember to wait a few moments before tasting again. 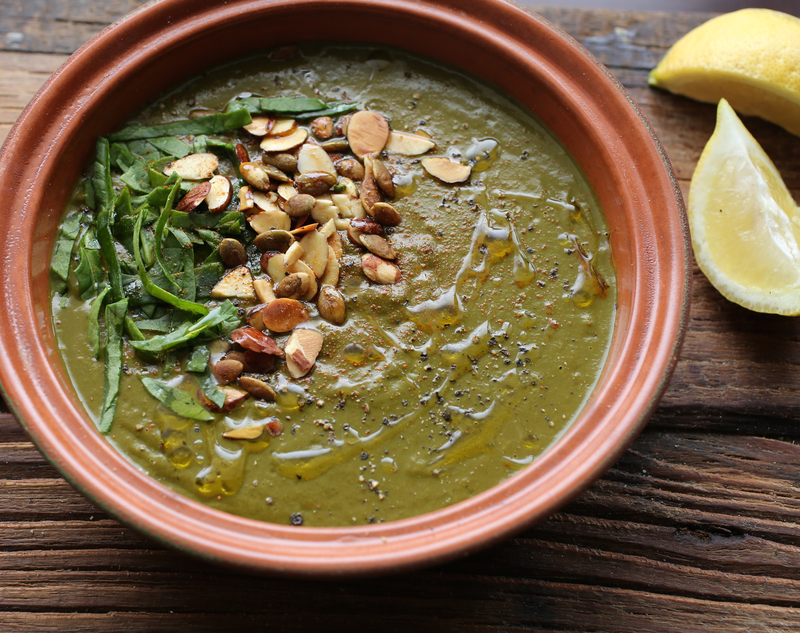 To serve, ladle into bowls and drizzle with olive oil. 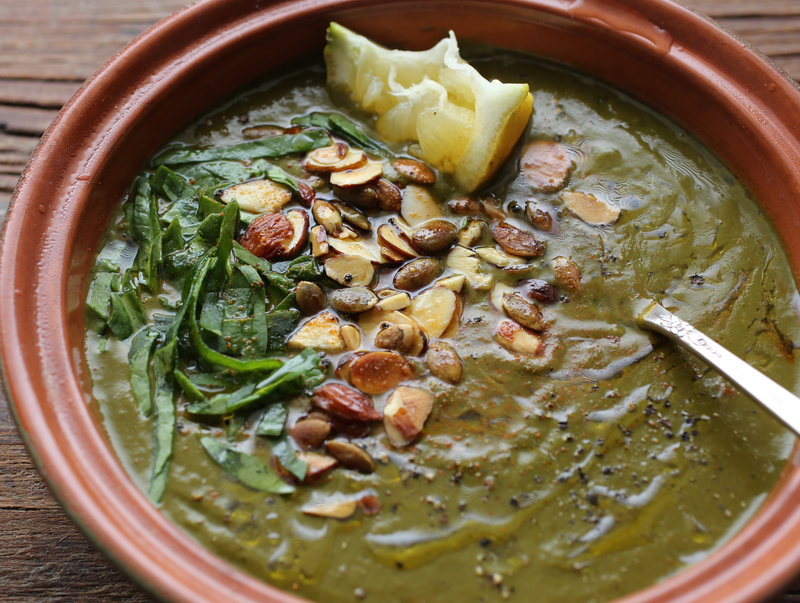 Garnish with toasted almonds, toasted pumpkin seeds, and/or chopped fresh spinach. Sprinkle with black and cayenne pepper, if you like. How true. I am one of those people who need to follow the tips for mindfulness. Thank you for the reminder, that we do need to take care of ourselves. Oops. I hit send before I was ready. Yes. I often need to remind myself too to follow the tips I mentioned. Last night I didn’t have my phone on my night stand, a bad habit I will break, and this morning I wore my watch! I’m a work in progress. 🙂 thanks for commenting. Being mindful is a process that therapists are taught. Being present with a client–shutting out all personal agendas–should not be a lucky event you happen upon while giving therapy. The question is–What are you being present for with another person? I am present as clients retell their stories, relive their pain, and encounter new ways of living. It involves releasing my own expectations, prejudices, and predictions. I’ve learned that it gives the other person time to just “be”. It’s allowing that person’s humanness to unfold naturally–without hurry–in a space of safety, respect, and care. The process is not without challenges and uncomfortable moments. It involves journeying with someone in conversation–and conversation isn’t just about language. It happens through all the senses so sometimes it isn’t easy identifying the message. Being a therapist has helped me to be “mindful” with my own family–although after being mindful with my clients I find sometimes that “I” am the one in need of some mindfulness. As I said the process is not without challenges . . . But I can genuinely testify that the rewards–personally and professionally–cannot really be explained or described. They have to be experienced . . . in a mindful way. Has your training helped you to also be mindful when you’re alone? For example, I find it easier to be mindful with others, especially with my little one. I try to keep away from most technology and try to clear my head of to do lists while with him so he feels I’m fully present when we interact. However, when I’m alone, I love to multitask. I feel like I can be so much more efficient when doing several things at one time. However, I’m well aware that it’s not the best thing. Now I want to slow down more, for my own health and wellness. This is one reason why I started to wear a watch again, so I don’t have to look at my phone and get sucked in to checking email, sending texts, etc. I want to be mindful of my surroundings, particularly when I’m alone. If I eat alone, I don’t want to feel the need to be on my computer or read a book or magazine. I should just be able to sit there and enjoy the moment. So, this is one of my goals this year–to learn to be more mindful, even when alone. You’re right, the process is not without challenges, but the rewards are great. If you have any tips, please let me know! Very good post. I try to practice mindfulness, but it’s so easy to forget. When I remember, I am at my most fulfilled. These are very good tips and I’ve been at it for years. Thanks Amanda. It’s great that you practice mindfulness! And yes, it is so easy to forget. Fortunately, my family and great friends help me to remember. Thanks for commenting. All the best to you as you keep at being fulfilled for years to come! Mindfulness is definitely something that I have thought about but need more practice in.. i often get so distracted with the pace of everyday life that i forget my mindfulness techniques. Thanks for the reminder with this post, it was a very inspiring read. Delicious soup too!